» Forum » Electro-Mechanical » EM Pinball Tech » Bally Chime Unit, Canoe Clip??? » Bally Chime Unit, Canoe Clip??? Bally Chime Unit, Canoe Clip??? This is probably a stupid/uniformed question, but what is a Canoe Clip and where can I purchase two. I am rebuilding the chime unit of a 1972 Bally Space Time. I got the rebuild kit from PBR. I have started putting the unit back together after disassembling the unit and cleaning. I took a lot of pictures. I am also using the 1976 Parts Catalog as a reference. Which leads to my question. 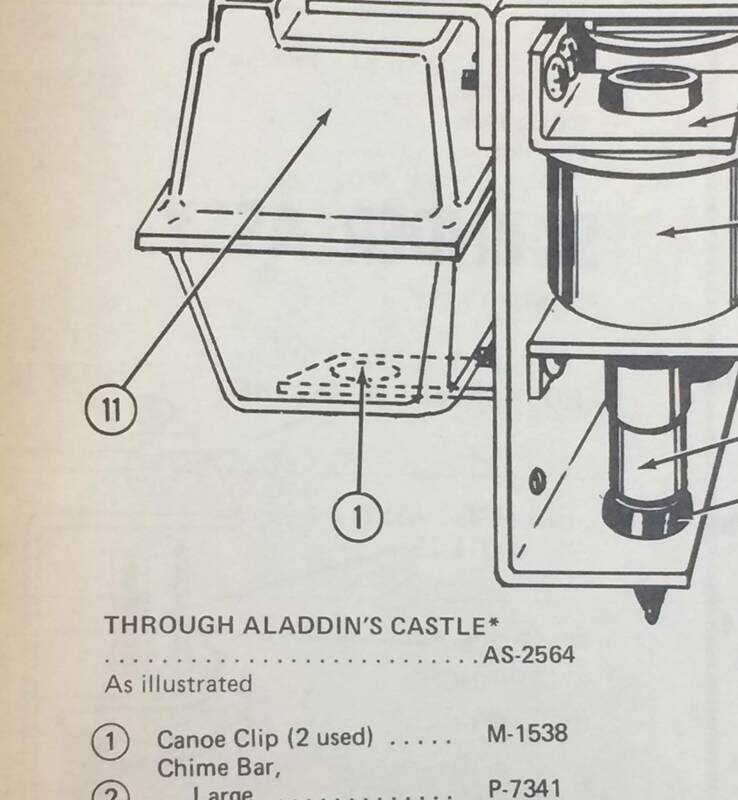 The catalog shows the chime unit using two Canoe Clips (see number 1 on the diagram from the parts catalog below). My chime unit did not have any clips where the catalog show a Canoe Clip. Is the Canoe Clip necessary? if so what the hell are they and does anyone know where I can purchase them? I did not find them on PBR, Marcos, John Jukes site, or eBay. I forgot to add. the sound box was attached with two self tapping screws. Pretty sure these are not Canoe Clips. If you Google canoe clip there are lots of pics of that familiar push on plastic clip. But I'm with you, on both my Bon Voyage and Monte Carlo which are similar vintage that sound box is attached to those two metal brackets with two metal screws, not the clips. Not sure why the change.